Sat., Sept. 30, 2017, 9:18 p.m.
CORVALLIS, Ore. – Jake Browning threw for three touchdowns, Myles Gaskin ran for 113 yards and a score and No. 6 Washington broke open a close game with a 21-point third quarter to beat Oregon State 42-7 on Saturday night. Browning completed 26 of 34 passes for 293 yards and had touchdown passes of 5, 15 and 34 yards to Dante Pettis, who had 12 catches for 105 yards. Browning has now accounted for 12 touchdowns, 10 passing, in three career games against Oregon State. Gaskin ran for a third-quarter touchdown of 32 yards, and had 15 carries in posting his second consecutive 100-plus-yard game for Washington (5-0, 2-0 Pac-12). The Huskies finished with 509 yards after struggling to get going initially. 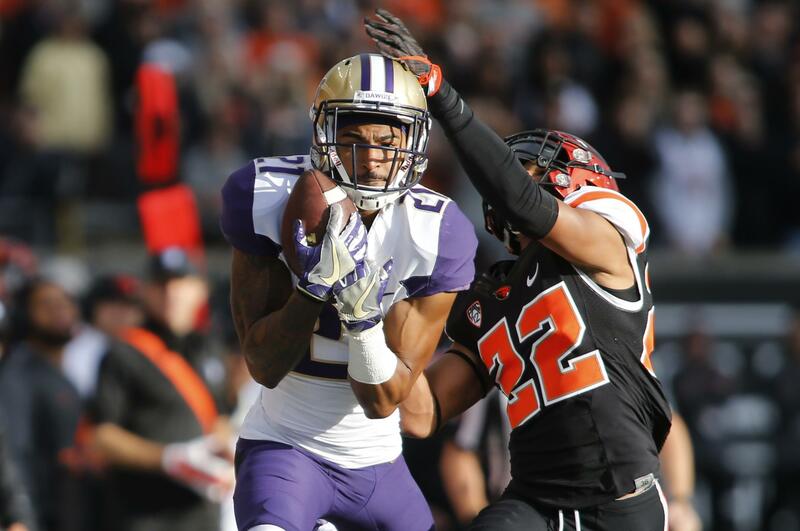 Washington carved up Oregon State on its first drive, marching 98 yards in 10 plays. Browning scored on an 11-yard run to give the Huskies a 7-0 lead. But Oregon State’s defense, statistically one of the worst in Division I in nearly every category, rebounded with a strong performance the rest of the half. Washington threatened only once on its final four drives of the half and came up empty when Tristan Vizcaino bounced a 42-yard field goal attempt off the left upright. Published: Sept. 30, 2017, 9:18 p.m.